The HemoCue® Hemoglobin systems provide an opportunity for quick, simple and reliable quantitative hemoglobin results with the same performance as a large hematology analyzer. The dual wavelength analyzers correct for lipemia, leucocytosis and other sources of turbidity. Any blood source (capillary, venous or arterial) can be used. The disposable microcuvette collects the exact amount of blood and mixes the sample with the reagents automatically. The microcuvette is placed into the portable analyzer. Results appear on the display in about a minute. Sample material: Capillary, venous or arterial whole blood. Measurement range: 0-25.6 g/dL (0-256 g/L or 0-15.9 mmol/L). Results: In about 60 seconds. Weight: 1 kg (2 pounds) with batteries installed. Power: AC Adapter or batteries. Operating temperature: 15-30 °C (59-86 °F). Quality control: Check the function of the photometer on a daily basis by measuring the control cuvette. Calibration: The analyzers are calibrated at the factory against the ICSH reference method and needs no further calibration. Accuracy: Correlation of 0.99 when compared to the reference method (ICSH method). 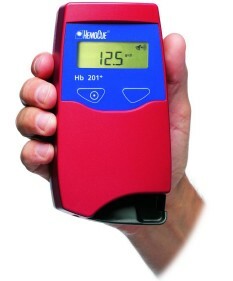 Storage for HemoCue® B-Hemoglobin Photometer: The photometer can be stored at temperature 0-50 °C (32-122 °F). Storage for HemoCue® B-Hemoglobin Microcuvettes: The microcuvettes are to be stored at 15-30 °C (59-86 °F) in a dry place. Use the Microcuvettes prior to their expiry date. Once the vial is opened the microcuvettes are stable for three months. Replace the cap immediately after microcuvettes are removed from the container. Method: Vanzetti, G. An azidemethemoglobin method for hemoglobin determination in blood. J. Lab. Clin. Med. 67, 116-26 (1966). Principle: The reaction in the microcuvette is a modified azidemethemoglobin reaction. The erythrocyte membranes are disintegrated by sodium deoxycholate, releasing the hemoglobin. Sodium nitrite converts the hemoglobin iron from the ferrous to the ferric state to form methemoglobin, which then combines with azide to form azidmethemoglobin. The photometer uses a double wavelength measuring method, 570 nm and 880 nm, for compensation of turbidity. Weight: 350 g (0.77 pounds) with batteries installed. Quality control: Built-in "selftest". The system can be verified using liquid controls. Storage for HemoCue® Hb 201 Analyzer: The analyzer can be stored at temperature 0-50 °C (32-122 °F). Storage for vial packaged HemoCue®Hb 201 Microcuvettes: The microcuvettes are to be stored at 15-30 °C (59-86 °F) in a dry place. Use the microcuvettes prior to their expiry date. Once the vial is opened the microcuvettes are stable for three months. Always keep the vial closed. Storage for individual packaged HemoCue® Hb 201 Microcuvettes: The microcuvettes are to be stored at 15-30 °C (59-86 °F) in a dry place. Use the microcuvettes prior to their expiry date. The expiry date is printed on each container as well as on each individual package.